Hyannis Port Massachusetts has a large natural bay from which you can catch the ferries and catamarans to Nantucket and Martha’s Vineyard, embark on pleasure and whale watching cruises or chartered fishing excursions, and Barnstable Airport is the only place to fly to and from the Cape. 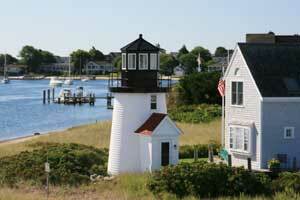 Hyannis is the largest village in the town of Barnstable, and one of the most well known locations on the Cape. The port of Hyannis, Hyannisport, is the largest and busiest port on the Cape. The port is situated on a large natural bay from which you can catch the ferries and catamarans to Nantucket and Martha’s Vineyard, embark on pleasure and whale watching cruises or chartered fishing excursions. There is plenty of entertainment in the area, including the Cape Cod Melody Tent, an outdoor venue that hosts a summer season of live performance, and a multitude of shops, restaurants, cafes, and taverns. Also of note is Hyannis’ long association with the Kennedy family; the Kennedy Compound is located in Hyannisport, and the town’s John F. Kennedy Hyannis Museum chronicles the family’s time there. Hyannis is also home to the Cape Cod Baseball League Hall of Fame and Museum, and Cape Cod Potato Chips (complete with a visitor’s center and factory tour). Although Hyannis lacks some of the charm of the smaller port towns on the Cape, there is always plenty to do in this thriving village. Hyannis has long been a favorite spot on the Cape for day visits, and its central location and proximity to all methods of transportation make it a good base for longer stays as well.